Now, I do sell my technical analyses through my two websites including this one, so I’m not free from also being labeled as a marketer, in addition to being a technical analyst and a trader. I have an expressive personality, and putting my analysis skills on the chopping block of the public arena has probably helped me develop even further than had I not done so. I live in Sweden and 95%+ of my trades are on stocks listed on the NASDAQ OMX Stockholm Exchange or on index products linked to the Swedish blue-chip index OMXS30. I’ve redacted my full name, my Shareville.se profile name and my account balance in SEK, as well as my amount of followers. The reasons for my redactions are that 1) I’m not comfortable sharing my exact portfolio size for privacy reasons (Sweden these days is infested with prying and envious people), and 2) I do not want other people to be able to find my profile easily on Shareville.se and follow my trades, because I don’t want to have what essentially becomes a front-running setup (because then I’ll be accused of “only running a front-running thing” and not having any real technical analysis and trading skills…). 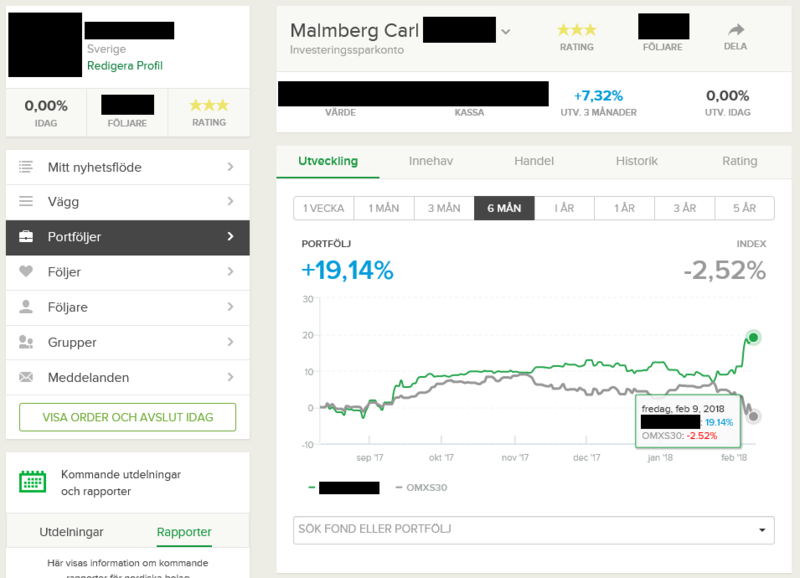 As you can see, my portfolio at Nordnet (the brokerage which operates the Shareville social trading site from which I’ve taken the screenshot of my account), has outperformed the Swedish blue-chip index OMXS30 by +21.66% over the last 6 months. It has the highest 3-star rating at Shareville, which means it’s among the best 10% of portfolios on Shareville, which has 80000+ users currently. An outperformance of +21,66% vs. the OMXS30 index and an actual gain of +19.14% over the last 6 months might not seem like much, but the Swedish stock market has been far weaker than the US stock market during the same period, creating several quite steep swings in both directions, which is not exactly an easy trading environment. But as you can see, I predicted and successfully traded this latest stock market mini-crash during the end of January and beginning of February 2018, making approximately +10% in a week during the crash. If you subscribe to another analysis service already, can their analysts say the same thing about themselves, and prove it? Most probably, they can’t. Other evidence that I was correct and profitable during the recent market turmoil. 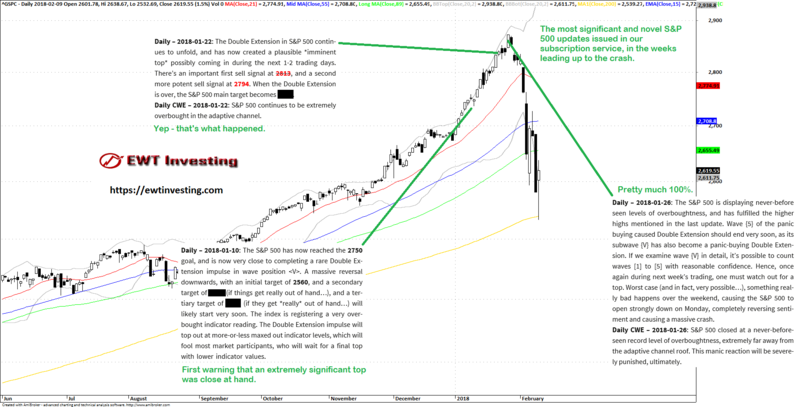 The pattern(s) discussed in the 2nd half of that article, have now been partially confirmed during the mini-crash, and I’m confident that I’ll be proven correct with that particular call and Elliot Wave model for the S&P 500. From the updates published on this website too, it’s pretty much clear that I had the right scenario (thus far at least). Even if you went short starting at my first warning on the 10th of January and you scale into positions like I do, you would’ve been in the money unless your negative positions were so highly leveraged they blew up during the final phase of the advance (which became a bit bigger than I expected, but that’s what Double Extensions do…). This analysis service – EWT Investing – is one of very few run by actual market professionals and successful traders. At only $19 per month for continuous updates on 20 financial markets worldwide, you get far more value from my service than from the absolute majority of overpriced Elliott Wave services. You can sign up for a subscription to the Global Elliott Wave Coverage through this link. Be aware that I’ll accept a maximum of 1000 subscribers because I don’t want to decrease the efficiency of my Elliott Wave work. Finally – let noone say “The crash wasn’t predictable” – the above text speaks for itself, that at least I got it very much right.